Dr. Robert E. McLaughlin II was born and raised in Charlottesville, Virginia. He attended The University Virginia as an Echols Scholar and graduated with academic distinction in 1992, having spent his junior year in Valencia, Spain. After graduation he returned to Spain, spending a year in Barcelona teaching English. He returned to The University of Virginia for medical school, graduating in 1997. He then spent five years as a resident in orthopedic surgery at Thomas Jefferson University in Philadelphia, PA, graduating in 2002. His training was completed with a one year shoulder fellowship in Jackson, Mississippi with world renowned shoulder surgeons Dr. Felix "Buddy" Savoie and Dr. Larry Field. Dr. McLaughlin is a board certified orthopedic surgeon who has dedicated his practice to shoulder arthroscopy and reconstruction. This includes disorders of the rotator cuff, impingement, arthritis, labral and biceps pathology, frozen shoulderas well as shoulder instability. He also specializes in revision rotator cuff repair and revision labral repair for failed surgeries. He is one of the only surgeons in the North East who arthroscopically performs revision rotator cuff repairs with tissue augmentation. Tissue augmentation can be used for failed rotator cuff repairs where patient’s own tissue is not healthy enough to support repair. He has been featured in the media for this ability. 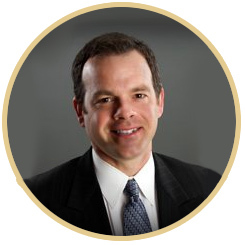 Dr. McLaughlin has been an associate master instructor for the Arthroscopy Association of North America since 2003. He is regularly invited to teach courses on shoulder arthroscopy to other board certified orthopedic surgeons throughout the country. Having spent 2 years living in Spain, he has become fluent in Spanish and offers courses to orthopedic surgeons from Central and South America as well as Spain. He has recently hosted shoulder arthroscopy courses for orthopedic surgeons from Mexico, Venezuela, Argentina as well as Korea. Dr. McLaughlin has recently been selected to participate in the German Arthroscopy Association traveling fellowship program. The German Arthroscopy Association is the largest arthroscopy association in Europe and every year selects three young surgeons to visit and observe orthopedic surgeons throughout the United States. They have traditionally only visited large academic medical centers, but Dr. McLaughlin has been selected as one of the only private practice orthopedic surgeons to be invited into the program. 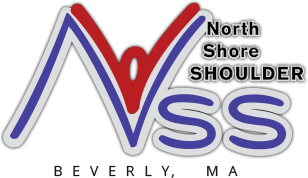 North Shore Shoulder is one of the only private practices in the North East that is dedicated to shoulder arthroscopy and reconstruction. Dr. McLaughlin has chosen to stay in the community setting for lifestyle reasons and to be able to spend more time with his family. 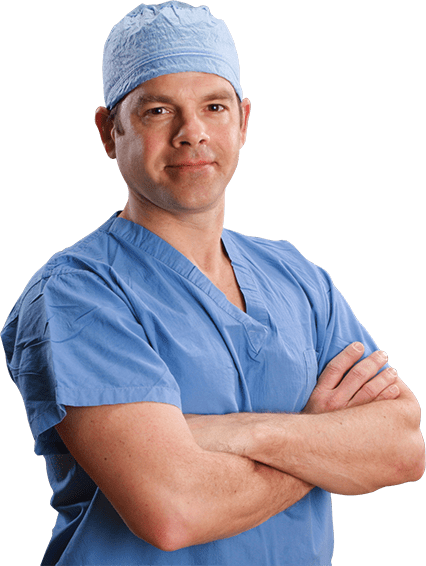 He started this practice to provide world class orthopedic shoulder care in a community setting and is dedicated to making North Shore Shoulder a true center of excellence. 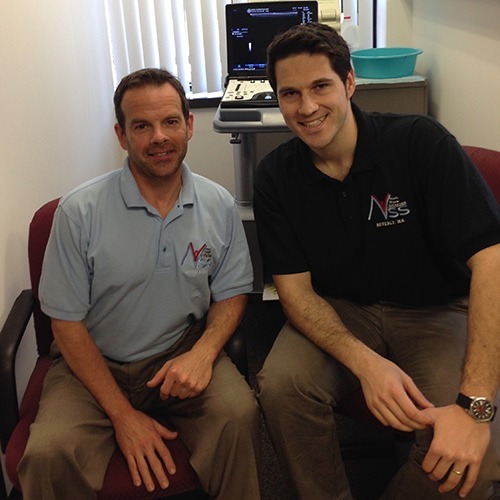 Dr. McLaughlin provides in office ultrasound for the diagnosis of rotator cuff and biceps pathology. Traditionally MRI has used to diagnose rotator cuff and biceps tendon tears, but recent advances in ultrasound technology has allowed for its use to evaluate both the rotator cuff and biceps tendon. Dr. McLaughlin has been trained in the use of in office ultrasound and offers it to his patients as an alternative to MRI. Some patients, such as those with pacemakers and claustrophobia, are unable to obtain an MRI, and ultrasound provides a viable alternative. The ultrasound can usually be performed during the scheduled office visit. This saves both time and money in possible co-pays that the patient may pay for an MRI. Dr. McLaughlin will be able to determine if ultrasound evaluation would be appropriate. If not a traditional MRI may be ordered. "I feel the one of the best compliments a shoulder patient provides is return business. Even though the surgery is arthroscopic, the recovery after rotator cuff or labral repair is arduous. It requires a period of shoulder immobilization followed by extensive physical therapy, which can be painful. Bobby Carpenter is an American ice hockey formal professional player. He played in the National Hockey League for 18 seasons from 1981-82 until 1998-99. Carpenter was traded to the Boston Bruins during the 1988-89 NHL season, and a year later he would help guide the Bruins to the NHL Stanley Cup Finals. He was a Stanley Cup Champion as a player in 1995, and as a coach in 2000 and 2003, all with the New Jersey Devils. 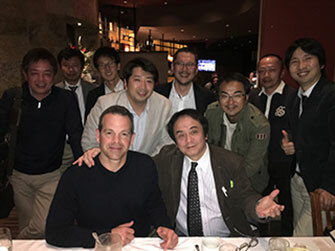 Dr. McLaughlin with a recent group of Japanese orthopaedic surgeon in the operating room and at dinner that evening. They came to observe Dr. McLaughlin in the operating room. Dr. McLaughlin was demonstrating his arthroscopic techniques for rotator cuff repair. He was also demonstrating a new suture anchor for rotator cuff repair. The Japanese surgeons were chosen to come and learn the new technique and return to Japan to teach it to other orthopaedic surgeons. They commented "Dr. McLaughlin has great technical skill and is very efficient with his time during surgery". They also thanked him for "being such a gracious host". 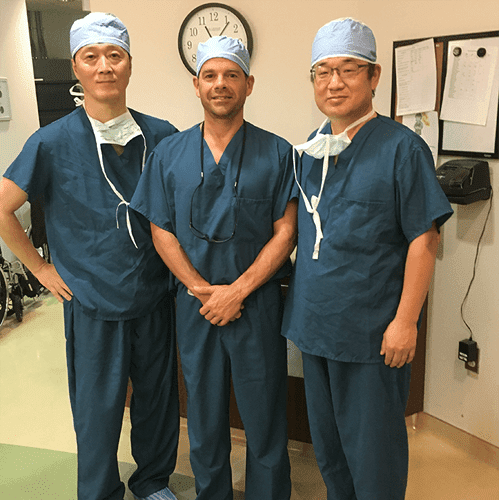 Dr. McLaughlin pictured with two visiting shoulder surgeons from South Korea, Dr. Sun and Dr. Kim. Dr. Sun is the founder and president of Sun's Orthopedic Clinic in Seoul. Dr. Kim is the Chairman of Orthopedic Surgery at Seoul Sacred Heart General Hospital. They requested to spend a day with Dr. McLaughlin in the operating room observing arthroscopic shoulder surgery. They exchanged ideas on new arthroscopic techniques for rotator cuff repair. 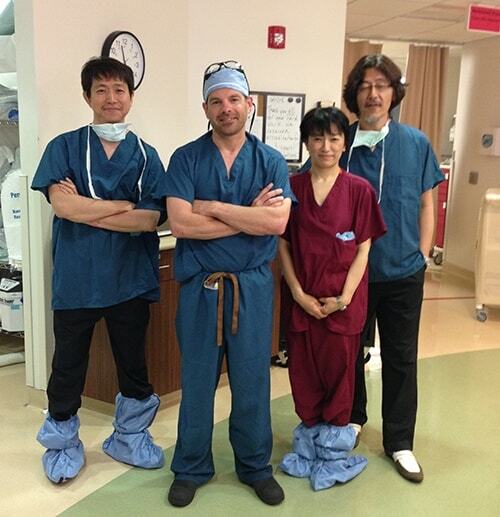 Dr. McLaughlin pictured with a group of visting Japanese orthopedic surgeons. 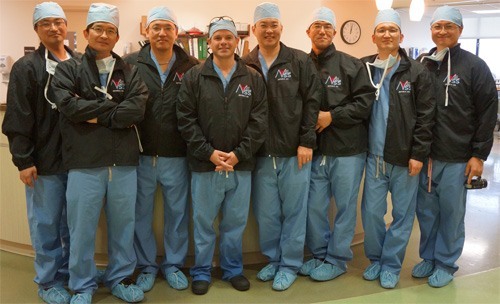 The surgeons speicialize in shoulder surgery and are from all areas of Japan. 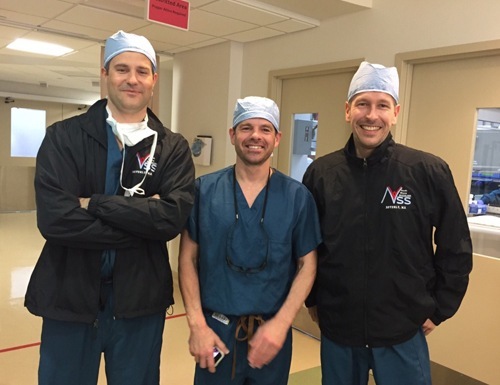 They visited Dr. McLaughlin to observe him in the operating room using a new type of anchor for rotator cuff repair. They wrote "Thank you so much for the great hospitality. It was a really valuable experience and we learned a great deal from the surgical observations. We look forward to out next visit." Dr. McLaughlin in Segorbe, Spain. 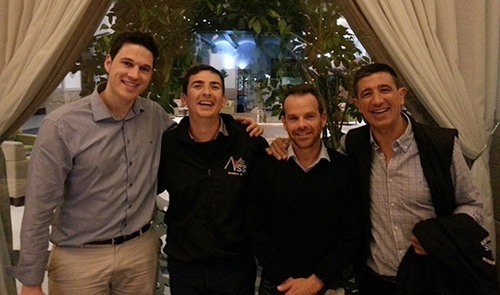 He is pictured with Dr. Alejandro Blasco, Dr. Agustin Pina, and Dr. Jose Aroca, orthopedic surgeons and members of the shoulder unit at Hospital La Fe, in Valencia Spain. Dr. McLaughlin was invited to speak to members of the orthopedic department on the diagnosis and arthroscopic treatment of shoulder disorders. He was also invited to tour the hospital facilities and observe surgery in the operating room. Dr. McLaughlin pictured with Dr. Alejandro Blasco. Dr. Blasco is an orthopedic surgery resident from Valencia, Spain and elected to spend two months training with Dr. McLaughlin. 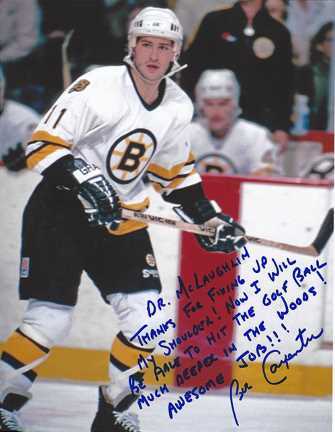 He worked with Dr. McLaughlin in the office and observed surgical procedures. Dr. Blasco intends to concentrate on shoulder surgery when he graduates. Dr. Blasco learned how to perform in-office ultrasound for the diganosis of rotator cuff tears as well as how to perform ultrasound guided injections. He has returned to Spain and plans on implementing what he has learned into his shoulder practice. Dr. Blasco thought it was "both a great professional and personal experience. 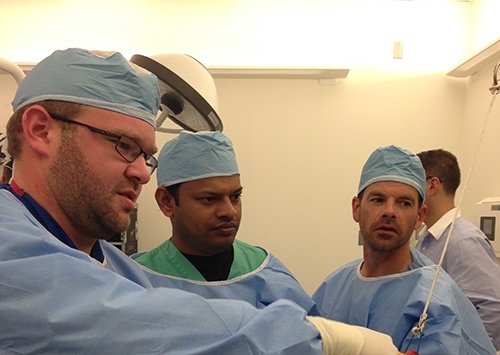 Dr. McLaughlin pictured teaching orthopaedic surgery residents at a recent shoulder arthroscopy lab. Dr. McLaughlin was one of 40 orthopaedic surgeons selected from around the country to help teach orthopaedic surgeons in training how to perform shoulder arthroscopy. The annual course, the largest resident seminar in the country, brought surgeons in training from around the globe to receive advanced training in shoulder arthroscopy. 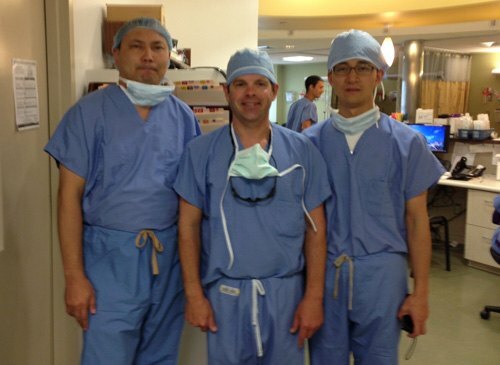 Dr McLaughlin pictured with three visiting orthopedic surgeons from Tokyo and Sapporo, Japan. They spent the day in the operating room with Dr. McLaughlin observing his arthroscopic shoulder rotator cuff repair techniques. Dr. Horigome, a prominent shoulder surgeon and the Senior Director of Orthpopedic Surgery at Asahikawa Kosei Hospital wrote: I would like to thank you for giving me an opportunity to visit your operating room on June 4. Your arthroscopic techniques such as camera work, shaving soft tissue without radioflequency ablation, standing position at tying knots, and suturing technique for rotator cuff repair were very helpful for my future operations. 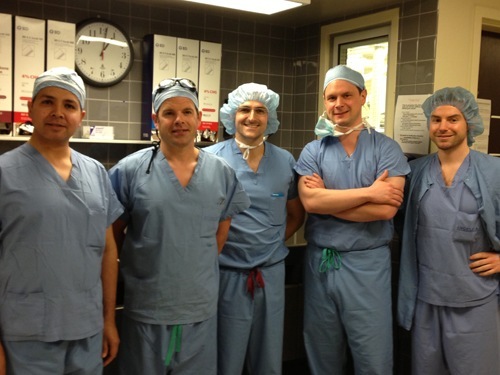 Dr. McLaughlin pictured with the 2015 German arthroscopy fellows in the operating room between cases. Each year the German Arthroscopy Association elects three orthopedic surgeons to visit arthroscopy specialists in the United States for a month. They visit various shoulder specialists throughout the country observing surgical procedures. Dr. McLaughlin has been invited by the German Arthroscopy Association to participate in this program for the last 6 years. They enjoyed their visit and gave Dr. McLaughlin "an 11 out of 10 for his sugical skills and repair techniques". 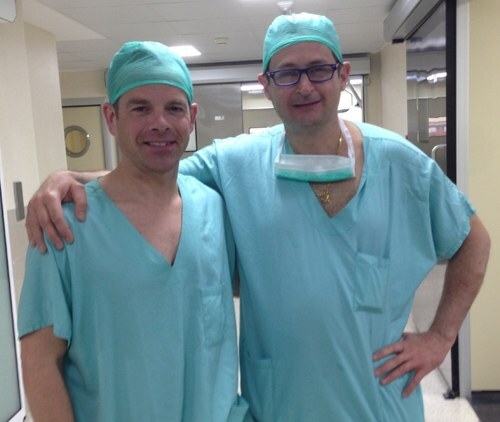 Dr. McLaughlin with Dr. Diego Sala Cuartero in the operating room in Valencia, Spain. Dr McLaughlin was invited to Spain to participate in arthroscopic shoulder surgery by Dr. Cuartero. Dr Cuartero also specializes in arthroscopic shoulder surgery, and invited Dr. McLaughlin to Spain to collaborate on new techniques for rotator cuff repair. March, 2015. 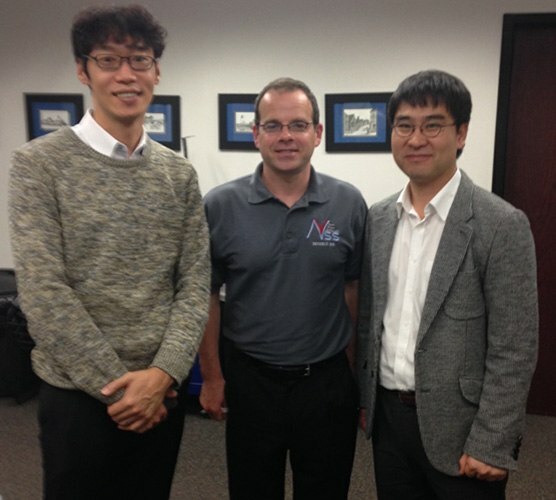 Dr. McLaughlin in the office with 2 visiting othopaedic surgeons from Seoul, South Korea. They recently spent 2 days in the office and in the operating room with Dr. McLaughlin. Dr. McLaughlin taught them how to use the in-office ultrasound machine to diagnose rotator cuff tears and they want to bring this technology back to Korea. They invited him to to Korea to teach surgical skills to orthopedic residents in the training program. 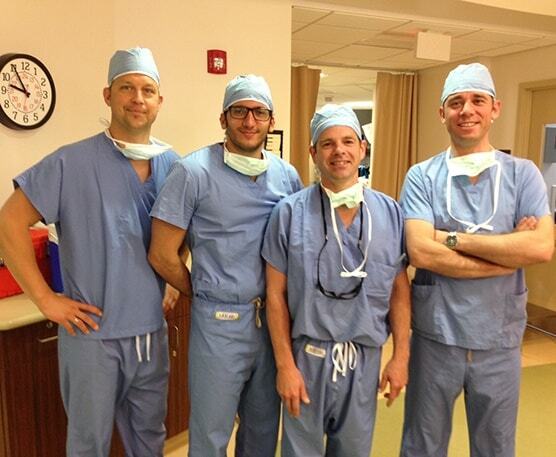 Dr. McLaughlin pictured with the 2014 German arthroscopy fellows in the operating room between cases. Each year the German Arthroscopy Association elects three orthopedic surgeons and sends them to United States for a month. They visit various shoulder specialists throughout the country observing surgical procedures. Dr. McLaughlin has been invited by the German Arthroscopy Association to participate in this program for the last 5 years. He hosted the surgeons for 2 days in the operating room, and they observed various arthroscopic shoulder procedures. When they left they commented that "Dr. McLaughlin was one of the top two surgeons they had seen during their visit." 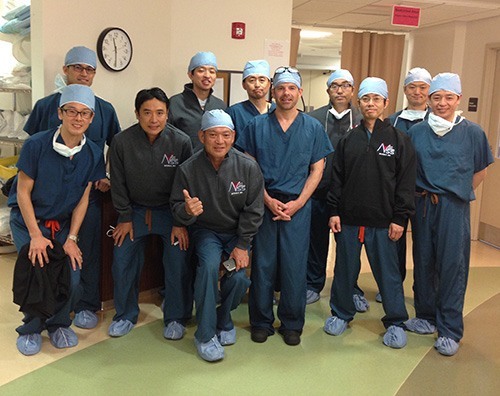 A new group of Chinese surgeons recently came to observe Dr. McLaughlin's shoulder surgeries. Here is what Dr Wang had to say. "I am Dr. Wang from Guang Zhou Red Cross Hospital, China, who observed your surgeries last week. It was a great opportunity for me to learn a lot from you, and I was impressed by your skillful surgical techniques. I have passed the message to my colleagues in China about inviting you coming to China, hope you can make it, I am looking forward to seeing you again soon in China!" 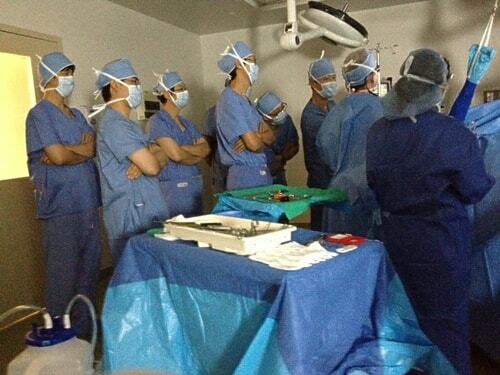 The Korean Surgeons observing Dr. McLaughlin in the operating room performing an arthroscopic rotator cuff repair. Dr. McLaughlin is the second from the right discussing his surgical techniques on a complicated case. Dr. McLaughlin with the newest group of visiting Korean Surgeons. They are all shoulder surgeons from Korea. They came to spend a day observing Dr. McLaughlin performing arthroscopic shoulder surgery. They also spent a day in the office with Dr. McLaughlin seeing patients and learning about in-office ultrasound for the diagnosis of shoulder disorders. Dr McLaughlin pictured at the Orthopaedic Learning Center. The Learning Center is located in Chicago and houses cadaveric labs for surgical instruction. 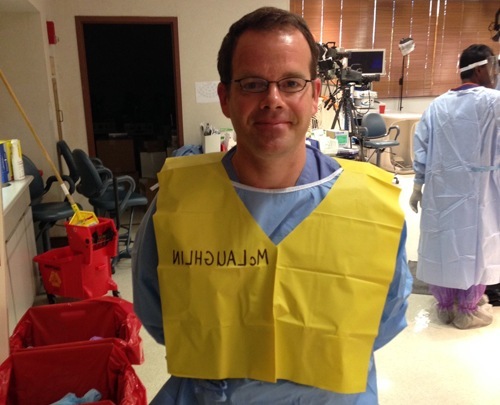 Dr McLaughlin has been selected as a associate master instructor by the Arthroscopy Association of North America. He volunteers as an instuctor, teaching other orthopaedic surgeon from around he country the latest arhroscopic shoulder techniques. 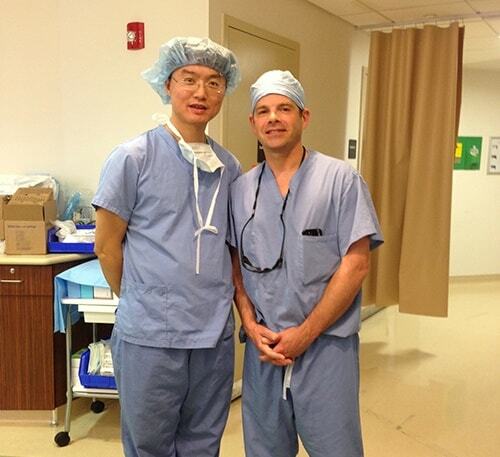 Dr McLaughlin with visiting surgeons from China. 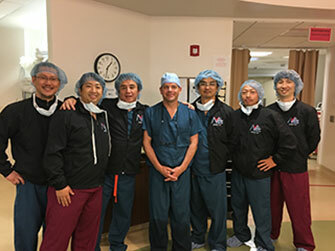 A group of orthopedic surgeons from China visited Dr McLaughlin in the operating room to observe his surgical tehcniques. They were impressed with his skills and have invited him to travel to China to teach other orthopedic surgeons in the spring of 2014. 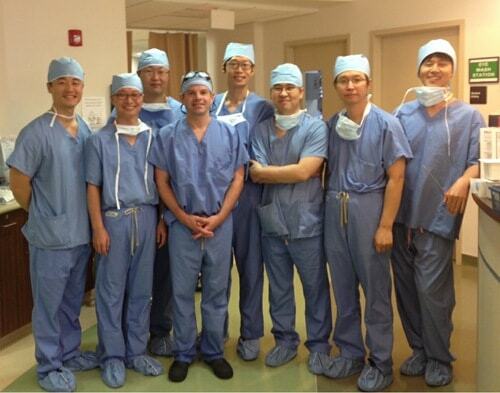 Dr McLaughlin in the operating room with the visting Orthopaedic Shoulder Surgeons from Korea. They are all wearing their team jackets from Dr McLaughlin.